Check out the cutest family on the Rideau Canal this weekend! I had a tonne of fun - lots of driving of course, but I filled in the time talking about relationships and work, lying and communication and finally, led us all in a questionnaire about learning styles. Turns out, our family is highly visual and not at all auditory in their learning preferences. Wonder why we talk so much, then? Sunday we got up for a monstrous breakfast (pancakes with a huge mound of fruit) and then skated the whole afternoon -- about 17 or 18 kms in total. Crazy! I haven't skated since... well, I guess I inline skated in the summer twice. 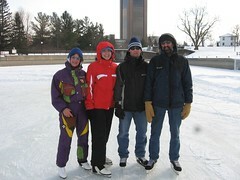 And the last time I went ice skating was at Winterlude last year. So it took me some time to get my skating legs back. But, by the end, I learned, finally, how to skate backwards! I was very proud of myself.